When you call Air Temp, you can be sure that you are contracting with a team of professionals who have the expertise and experience required to complete a comprehensive analysis of your systems and offer a long term solution. Our job is to properly analyze a situation and solve it with the most up-to-date technology, equipment, and products available. We perform service and repair on all brands and types of HVAC equipment for clients in a variety of industries. Heating and air conditioning systems require routine maintenance to maximize performance, maintain efficiency, ensure safety and increase reliability. Like any piece of equipment imperative to the daily operation of your business, systems should be inspected by an expert on a routine basis to ensure that your heating/cooling systems are operating safely and at peak performance. 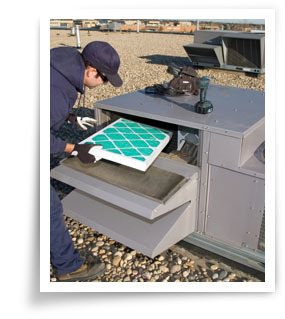 Planned, Predictive Maintenance is essential to the proper functioning of commercial HVAC equipment. If preventive maintenance is not performed regularly or if it is done haphazardly, the equipment will require extensive and costly repairs at a later date. This is why our planned maintenance agreements are critical to the longevity of your equipment and safety of your facility. Discounts – On the service and repairs of your equipment – including parts and labor. Peace of Mind – Preventative maintenance can substantially prolong the life of your equipment – saving you money! Long Term Savings – By reducing equipment repair costs, replacement costs, and reducing energy expenditures. Significantly Reduced Utility Bills – Clean, well-maintained equipment runs efficiently and at peak capacity, lowering the monthly utility bills at your business. The CARE program is a proactive Linc Service initiative designed to measure and improve customer satisfaction through direct customer feedback and communication. Through this program, an Air Temp Staff reviews the services provided to the customer and requests detailed feedback. This feedback is then followed-up on to insure complete customer satisfaction at all levels of the job. If you your facility is in need of a system repair or maintenance agreement, contact us or visit our information request form. Stay up to date with the latest industry trends, products and much more. © Copyright 2019 Air Temp Inc.